Stephen P. Schwartz: A Brief History of Analytic Philosophy. Wiley-Blackwell 2012, p. 182. And what if the interest in expressing oneself – like it is the case in my case – was the motivation that brought a person to philosophy? What would Wittgenstein say then? What would he have said, when he still was alive? Now, through Schwartz, I have come to know where the missing ‘philosophical Eros’ hides: Wittgenstein does not think that words are there to express one’s thoughts. But how should I have expected anything like that? Do I expect that do not want to fill their lungs with air? – No. Do I expect them not to want to eat and drink? – No. Do I expect them not to want any clothes or rooms with heating when it is cold outside? – No. So how should I have expected that Wittgenstein was saying/writing things without wanting to express his thoughts? If I do not want to express my thoughts I do not need to philosophize. I can not-express-my-thoughts as well when working at the cashpoint of a supermarket or while playing a trumpet. There are actually many positions available in our society for persons who do not want to express their thoughts: worker in an industrial plant, press officer, scientist. Actually, there are almost no positions in our society where one is supposed to express one’s thoughts. Therefore, I do not understand why philosophy especially attracts persons like Wittgenstein who desire nothing more than to not-express-their-thoughts. “Aren’t they rather the opposite of revolutionary?”, I remarked on the side of the page. After all, their project was that of a scientific philosophy. – And science is a very conservative thing by its very nature. Scientists strive to always hold the same opinion as the other members of their group. Science is the anti-revolutionary project par excellence. Once there was a revolutionary project of philosophy. Its idea consisted in the individal philosopher reflecting upon the collective truths of tradition and religious belief and finding out that all these contents were self-contradictory and incoherent. Such an individual philosopher who criticized collective certainties for sure had all the others against him. But against who can one make revolution against, if one beliefs – like scientists do – only in collective truths? -Against outsiders? -Strong performance! There is yet another reason that makes me wonder how scientific philosophers can by revolutionary: If one wants to discuss his opinion with other people, one needs to utter at least one whole opinion. But scientist usually do not discuss whole problems, they discuss parts of problems. It may also be in some cases that the scientist specialized on that very topic does not know what is the relevance of the problem he is working on. If this is the case, he is a riddle-solver; somebody, who just does not care about the meaning of his problem, as long as he has fun solving it. Normally, when you express your opinion this experience is person-constituting. A human being commits herself/himself to thinking in order to find out what she/he is convinced of. But scientific philosophy dealing with a quarter of a problem or a tenth of a problem is person-dissolving. One does not have to be one or the other kind of person to have one or the other opinion, because the problem is so tiny that it is not clear what follows from it, anyway. The scientific project has this peculiarity that it tends to conceive all problems this way, as parts of problems, as technicalities. So we end up with persons who dislike it to disagree with the community and who express arguments which are to small to be understood by lay people to think of themselves as revolutionaries. That’s weird. Of course, even though science can be revolutionary in the sense that it has revolutionary effects. This is actually the case as science is transforming our societies via technical innovations. But even in that case science is not revolutionary through its word, by convincing society. Because science is conservative pe se. Thinking about the 36th International Wittgenstein Symposium (2013) I remember the 34th International Wittgenstein Symposium (2011), where I became aware of the fact that in epistemology there exists a large discussion on the topic of peer disagreement. As I was not familiar with this discussion I understood the notion “peer” in a different way, and it was only one year later, through reading the papers of the past Wittgenstein Symposium that I understood that in this discussion “peers” are meant to be equals. Before that, when I had heard the term “peer” in “peer disagreement” and also in “peer review”, I had always remembered my school time when I had learned the sociological or psychological term of “peer pressure”. My notion of “peers”, derived from the concept of “peer pressure” had been that of boys, two or three years older and also stronger than myself, who told me what to believe and punched me into my belly, if I refused to believe what they told me. That is to say: My notion of “peers” was not exactly that of equals; rather the opposite. Then I read a paper on “peer disagreement” and found out that “peers” are meant to be equals. I was really astonished about that, and till today I am not quite sure whether I should accept to believe it that peers are really equals. I mean, take for instance peer review: There is a collegue from the same discipline as you, but he/she is in the position to give you a punch into your belly by refusing your submitted article. Can somebody be a peer to me, if he/she is in a position to judge me? It appears to me rather that a person in the position to judge another person is in a higher position than that other person. Moreover, they do not ask just anybody to do peer reviewing; one has to have already a record track and a name in the specific field of expertise to be asked to become a peer reviewer. Another reason why I was astonished about the discussion about peer disagreement in philosophy was the fact that I had always believed that philosphy had always been a project directed especially against peer agreement. In old Greece, a philosopher would abandon society in order to reflect upon common traditions and beliefs, and by doing that he would find out that these traditions and beliefs (the beliefs of the peers) are incoherent and unconvincing. I was, thus, surprised to learn that in the discusson on peer disagreement philosophers try to establish and defend the specific conditions when somebody is allowed to disagree with his/her peers. It seemed for as if disagreement for them was a problem, something that has to be justified by special conditions under which a disagreeing proposition is uttered. To me, disagreement never seemed to be a problem. I rather thought agreement to be suspicious, for it might point at the fact that one or some persons told the others what to believe on a certain subject, and the others believed it because they did not take the effort to find out what they themselves thought about that very subject. Scientists and scientific philosophers, of course, will tend to another way of thinking, because for them nothing is achieved (in a certain field or in the discussion about a specific problem) if agreement is not achieved. Knowledge in science is just another word for agreement: it is that upon which we have agreed that we now in fact do know it. Still, if I hear the word “peers”, I can feel the punches into my belly, and I have the urge to retract myself from the discussion about “peer disagreement” in order to think FOR MYSELF if I believe that it is really possible that a peer is my equal and if that the way philosophers use this word isn’t, in the end, an ideological one. 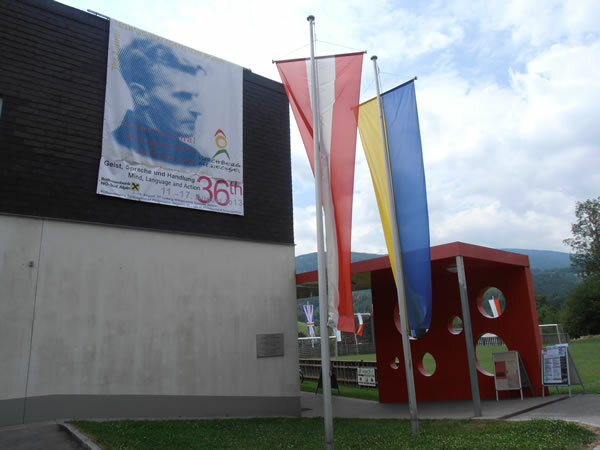 The 36th International Wittgenstein Symposium took place in Kirchberg/Wechsel, Lower Austria, 11-17 August 2013. It was organized by Daniele Moyal-Sharrock, Volker A. Munz, and Annalisa Coliva. This year’s topic was “Mind, Language, and Action”. The Wittgenstein Symposium is a large symposium, 11 plenary talks and 174 talks in sections were offered. Every day, from Monday to Friday, one had to choose between 36 talks in the 6 sections. That means that one was able to listen at the most to 6 of them, missing the other 30. The participants of the Symposium were accomodated in Kirchberg and other small villages nearby (Raach, Trattenbach, St. Corona, Ödenhof, Unternberg). Free shuttle busses were available for them to go to the congress center, the primary school of Kirchberg, in the mornings and back to their rooms in the evenings at 20:30 p.m or 23:00 p.m. There were two groups of very different level of importance at the Wittgenstein Symposium. The important participants were the invited speakers; their talks were plenary talks (1 hour, 30 min for discussion) in the morning, and their talks were published in a hardcover book by the editorial De Gruyter (before that by the editorial Ontos). Participants, who had submitted papers to the symposium, were not so important. Their talks (30 min, 10 min for discussion) took place in the sections and were published in a voluminous brochure, soft cover, format A4. c) students and young graduates who need the attendance at an international conference in philosophy for their PhD study programs or for their CVs. The talks at the Wittgenstein Symposium, in most cases, have the same structure: the positions of two philosophers, e.g. Anscombe and Wittgenstein, are presented and afterwards one of them is defended against the other. The speaker may also argue that both of them are false, and that a third philosopher is right in what he or she stated on that topic. It may happen that a listener of a talk is indifferent to both of the presented philosophical positions. In this case the speaker will give no clue as to why he/she thinks that these positions are important or in which framework or conception they are relevant. The question heard most often in the breaks between the talks was: “What are you working on?” Possible answers to that question were: “theory of action”, “enactivism”, “intentional actions”, “joined actions”, “propositional attitudes”, “language acquisition”, and so on. The word “working” in the question “What are you working on?” seemed to point to the fact that the result of this work would be an diploma or PhD thesis, or a paper, published in an international journal of philosophy, but not an answer to a question the philosopher is interested in, personally. By attending a symposium like the Wittgenstein Symposium in Kirchberg one can arrive at the conclusion that a basic human capability has become lost: the capability of a person to tell others about an issue, because she is interested in it; the capability of communicating one’s interests to others. After listening to the talks at the Wittgenstein Symposiums and to the private discussions during lunch time and in the evenings, I experienced the strong impression that there was not possible meaning of a philosophical stance other than that of deciding upon who is right about a specific question, Wittgenstein or Anscombe, Davidson or Putnam. I felt that there was no other interest in a philosophical problem than that one of making a PhD thesis or a published paper out of it. These assertions have to be understood in a strong sense: There was no other interest that could be thought of in such situations; there was no other interest in those problems that could be imagined existing anywhere. The phrase “I am interested in …”, meaning that there is some motivation in myself which directs my attention to one question or the other, seemed to be absurd after the Wittgenstein Symposium.